FileBound is designed to be easy-to-deploy, highly configurable, scalable, flexible and secure, with an intuitive user interface. We provide our customers with the best experience for integrating FileBound software products with other third-party, line of business applications. 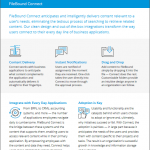 FileBound Connect – Our new desktop tool gives users a straight line into FileBound from their various line-of-business applications. 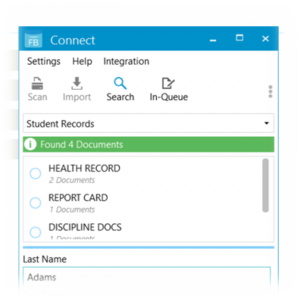 Connect sits in the corner of users’ screens and provides instant notifications if the user has a new assignment or when the system has content pertaining to the application. Find and view documents, drag documents from your PC straight into online files, and create new files all from within Connect. This tool reduces toggling, allows users to work more efficiently, and has been built and modeled against customer feedback. It’s easy to use and therefore, adoption is gained almost instantaneously – which helps to promote widespread use and the maintainability of customer processes.